Maxime Vachier-Lagrave (French pronunciation: ​; sometimes referred to as MVL; born 21 October 1990) is a French chess Grandmaster and the 2009 World Junior Chess Champion. He is currently the No. 1 ranked player in France. Vachier-Lagrave is a three-time French champion (2007, 2011, shared 2012), four-time winner of the Biel Grandmaster Tournament (2009, 2013, 2014, 2015), semifinalist of the 2013 Chess World Cup, and participant of the 2015 Grand Chess Tour. From the age of six years, Vachier-Lagrave competed in numerous sections of youth tournaments, winning the French Under-8 championship in 1997, U-10s in 1999, U-12s in 2000, U-16s in 2002, runner up in the U-18s in 2003 and won the U-20s in 2004 scoring 8/9. He also took part in the World Youth Chess Championship, coming third in the U-10 division in 2000 (8½/11), third in the U-12 championship in 2001 (8/11), second in the U-14 event in 2003 (9/11) and third in U-16 section in 2005 (8½/11). From 2001 to 2008, his FIDE rating increased steadily from 2198 in January 2001 to 2637 in January 2008. 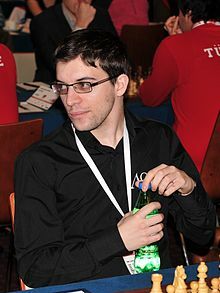 Vachier Lagrave broke the 2600 barrier in October 2007 and broke 2700 one year later. He became an International Master in 2004 and achieved the Grandmaster title in 2005 at the age of 14 years and 4 months after sharing first in the 2004 Paris Championship with 6½/9, winning the NAO GM tournament in 2004 with 6/9 and coming second in the Évry GM tournament in February 2005 with 7½/9. His strong results culminated in winning the World Junior Chess Championship held in Puerto Madryn, Argentina in 2009, scoring 10½/13. In 2005, Vachier-Lagrave finished in third place at the French Chess Championship with 7/11 and fifth place. Winner of the 2009 Biel Grandmaster Tournament with 6 points out of 10 ahead of Morozevich and Ivanchuk. Winner of the 2012 SPICE Cup Festival at Webster University with 6 points out of 10 ahead of Le Quang Liem, Ding Liren, Wesley So, Georg Meier, and Csaba Balogh. In the 2013 Alekhine Memorial tournament, held from 20 April to 1 May, Vachier-Lagrave finished eighth, with +2−2=5. 2013: Semifinalist at the Chess World Cup 2013. 2014: Winner of the 2014 Biel Grandmaster Tournament with 6 points out of 10 ahead of Radoslaw Wojtaszek. 2014: Participant in the Sinquefield Cup 2014 in Saint Louis, USA, the strongest chess tournament ever held in the history of chess. 2014-2015: Participant in the FIDE Grand Prix 2014-15, one of the qualifying methods of the 2016 World Chess Championship cycle. 2015: Winner of the 2015 Biel Grandmaster Tournament with 6.5 points out of 10 ahead of Radoslaw Wojtaszek. 4th victory in Biel and 3rd consecutive victory. 2015: Second Place at the World Blitz Championship in Berlin with 15 points out of 21, only 0.5 point behind Alexander Grischuk. Top 16 2005-2006: NAO team, 6½ points from 8 games. NAO-CC won the championship for the fourth time in a row.